(1) Is the Big Ten expanding to 16 or 18 (or more) and if so, when? – Teddy Greenstein of the Chicago Tribune recently noted that there are some within the Big Ten that believe that the conference won’t stop expanding until it gets to 18 schools. That being said, I’m not someone that believes that further Big Ten expansion is imminent. Sure, there are schools that the Big Ten seem to be more than willing to add to create a legit superconference (e.g. Virginia, North Carolina, Georgia Tech and, of course, Notre Dame), but I continue to believe that there isn’t going to be some type of impending exodus from the ACC. Look back at how much of a sales job the Big Ten needed to procure Maryland, which is a school in a state contiguous to the current Big Ten footprint, has relatively weak conference rivalries (Terps fans may care about Duke and UNC, but it’s not reciprocated), has turned into a Northern school from a cultural perspective and clearly needed more athletic department money. From my vantage point, the members of the ACC still like the league even if they’re wary about the TV contract (whereas the Big 12 is the opposite where everyone outside of Texas really isn’t a huge fan of the league per se but are happy about the latest TV deal). Are the Big Ten and SEC stronger than the ACC? Absolutely. However, that doesn’t automatically mean that the ACC is a sitting duck that’s about to get picked apart. Let’s put it this way: if the Big Ten really thought that it could obtain all of the ACC schools that I’ve seen rumored that the conference wants to add in such a quick manner (e.g. within the next year), then I highly doubt that Jim Delany would have granted an invite to Rutgers. That’s not a knock on Rutgers and what it can bring to the table in the new Big Ten setup (the school makes sense as an addition for various reasons, not the least of which is a presence in the New York City metro area), but UVA, UNC, Georgia Tech and probably Duke (yes, Duke, and yes, I need to take a shower after saying that) would have all been ahead of the Scarlet Knights on the pecking order. Convincing Maryland to head to the Big Ten was tough enough and that’s nothing compared to persuading truly Southern schools such as UVA and UNC to come along (and by the same token, the SEC isn’t going to be as attractive to those same schools as it was to Texas A&M and Missouri). As a Big Ten guy, I personally see a ton of benefits for the conference if it raids the ACC further. From an objective standpoint, though, I don’t see that happening soon. The threat of the Big Ten being on the prowl probably gives the conference more power than it does in terms of actually striking. I know this much: the Big Ten will wait for who it really wants at this point. They’re not going to force anything other than a 100% fit and to me, that would likely need to be some combo of UVA, UNC, Georgia Tech and/or Notre Dame (although I’d personally want to see Florida State become a prime target). That could take awhile to come to fruition, so I believe we can put the Superconference Armageddon scenarios away for the time being as realistic (even though they’re so much fun to talk about as hypotheticals). (2) What are the Big Ten divisions going to look like? – Greenstein’s report also intimated that the Big Ten was looking at an East/West split for divisions with the possibility of putting Northwestern in the East due to its alumni contingents in the New York and Washington, DC regions. 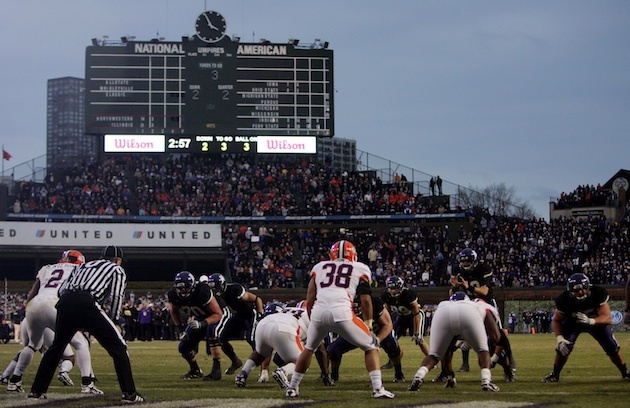 However, the word out of Northwestern is that they would prefer to stay in the West with its closer rivals such as Illinois, Iowa and Wisconsin along with enjoying a massive influx of Nebraska fans buying up tickets in Evanston every other year. From what I’ve seen, the divisional alignment that I had proposed a couple of weeks ago with Michigan State in the West and both Indiana and Purdue in the East and every school having a protected cross division rival won’t come to fruition. If Northwestern is in the West (and I’ll be honest as an Illinois fan that I’d personally be pretty pissed if Northwestern ends up in the East on top of Michigan, Ohio State and Penn State), then it would seem that Indiana would make more sense as the Hoosier State rep in the East (look at this Wall Street Journal article from a few years ago about how many East Coast students have been invading Bloomington lately) while Purdue would head to the West. That would mean the East would have Michigan, Ohio State, Penn State, Rutgers, Maryland, Michigan State and Indiana, while the West would have Nebraska, Wisconsin, Minnesota, Iowa, Northwestern, Illinois and Purdue. In that event, I would hope that the Big Ten assigns Indiana-Purdue as the only protected cross division rivalry while everyone else goes on a regular rotation. This would allow the West schools to continue playing Michigan and Ohio State more often, especially if the Big Ten increases its conference schedule to 9 games. The Pac-12 did the right thing by only making the games between the various California-based members into annual cross division games and not trying to force any unnatural pairings. Hopefully, the Big Ten has the good sense to do the same. (3) What’s going on with the Big East/Mountain West skirmish? – As of now, the conference realignment action is really happening outside of the scope of the five power conferences (Big Ten, SEC, Pac-12, ACC and Big 12). The latest cog in the Gang of Five wheel is San Diego State, which is faced with a decision of whether to “go back” to the Mountain West Conference (which they are still a member of until July 1st) or “stay” with the Big East as football-only member (which they have committed to join on that date) and the Big West for basketball and Olympic sports. I don’t envy the decision that has to be made by the Aztecs since neither option is exactly optimal – it’s either being in the MWC, which has a new TV deal structure that will largely benefit Boise State, or the Big East whose membership is in flux and SDSU will almost certainly be the lone extreme geographic outlier. Even though there’s a case to be made that San Diego State would make more football TV money in the Big East and actually reduce their Olympics sports travel costs in the Big West, I believe that the Aztecs will ultimately stick with the MWC. It comes down to a simple question: would San Diego State have chosen to join the Big East one year ago if it knew how the league would look today? In my opinion, it would be an emphatic “No”, as evidenced by schools in smaller markets such as UNLV and Fresno State having since rejected overtures from the Big East. It would have been one thing if the Big East still had AQ status (or the equivalent of it in the new postseason system) or could reasonably procure an outsized TV contract compared to the MWC (which is what Big East commissioner Mike Aresco has been trying to convince people will be coming down the pike even though no one outside of Big East partisans believes him), but being the sole West Coast team in a league that isn’t receiving favored treatment anymore and looks like it won’t be adding anyone else within 1500 miles of your school (which we’ll get to in a moment) is a rough thing for any university president or athletic director to sign up for. Now, that doesn’t mean that the Big East is a bad choice for everyone. Houston and SMU, who have been rumored to be targets of the MWC, still make a lot more sense in the Big East. At worst, those schools will be in a better version of the Conference USA that they will be leaving, so the MWC doesn’t provide much upside comparatively. As much as some observers seem to want to watch conferences just pack it in and completely die off, the Big East (or whatever it will be called in the future, which is a separate issue) can still survive as an entity with the pieces that it still has left. Tulsa appears to be a Big East expansion target, which would be a solid addition for its Southwestern flank. UMass is also out there as a classic “university presidents might love it and fans will hate it” option – they have a nascent and struggling FBS program yet offer a public flagship university in the Northeast that plays football at that level (which otherwise don’t exist at all outside of the 5 power conferences plus UConn). Several other schools from Conference USA (e.g. Southern Mississippi) and the MAC (e.g. Northern Illinois) might also get a look, but my feeling is that Tulsa and UMass are the frontrunners to get the Big East up to 12 football members (assuming that San Diego State stays in the MWC) as soon as possible. The league would then do everything it can to keep Navy on board as an addition for 2015 and, if Mike Aresco is successful in doing so, would target one more school on top of that to get to 14 schools for that season. (4) What is the TV Contract and Expansion Status for the “Catholic 7”? – The Catholic 7 defectors from the Big East (DePaul, St. John’s, Marquette, Georgetown, Seton Hall, Villanova and Providence) have upended the “football means everything and basketball means nothing” axiom of conference realignment. According to Darren Rovell of ESPN. com, Fox has offered $500 million over 12 years for the Catholic 7, with the assumption that the group adds 5 more schools to get up to 12 members. That figure will likely be larger than what the football playing schools in the Big East will receive for both football and basketball. I’ve said many times on this blog that football in and of itself isn’t what’s valuable, but rather quality content. In this case, the Catholic 7 are offering quality content in their sphere of non-FBS basketball schools with traditional schools in large urban markets. The problem with so many conferences is that they’re trying to apply the way that the Big Ten and SEC make money via football when they don’t have the assets to do it properly. It would be akin to a mom-and-pop corner store trying to run a business like Wal-Mart or Target without the requisite supply chain. Not every conference can be all things to all people in the manner of the Big Ten and SEC, so the Catholic 7 was smart enough to realize (or at least make the right decision when backed into a corner) that they can exploit a lucrative niche. They became the Trader Joe’s of college conferences as opposed to Wal-Mart, if you will. Instead of being subject to the whims of raids from the 5 more powerful football conferences as members of the hybrid Big East, the Catholic 7 have positioned themselves as arguably the most powerful non-FBS sports conference out there. The non-FBS market might be much smaller than the FBS market as a whole, but there’s something to be said to being #1 in the former with complete control of your destiny as opposed to #6 (or even #7) in the latter without any buying power. With the Fox offer apparently contingent upon the Catholic 7 adding 5 schools, that brings into question who would be the expansion candidates. Xavier and Butler have been continuously named by several separate outlets as locks, so that takes up the first two spots. The next 2 most likely targets appear to be Dayton (great fan base) and Creighton (ditto with a top notch on-the-court program right now on top of that). All 4 of those schools should feel fairly comfortable about getting into the new league with the Catholic 7 (which may very well still end up with the Big East brand name when all is said and done) with this news about Fox wanting a 12-team league. That leaves the last spot that appears to be a battle between St. Louis and Virginia Commonwealth. If I were running the Catholic 7, I’d definitely recommend SLU as school #12. From my vantage point, this is an opportunity for this group of schools to create a conference with branding that goes beyond athletics with like-minded institutions. Essentially, the new league can be to urban undergraduate-focused private schools in the Midwest and East Coast what the Big Ten is to large research institutions in the same region. In that regard, SLU is a perfect institutional fit with the Catholic 7 and the 4 other schools mentioned. SLU also has excellent basketball facilities and a solid history in the sport, so it’s not as if though this would be a poor on-the-court move. VCU, on the other hand, would purely be a basketball resume addition. Now, there’s certainly nothing wrong with that approach, as this new league is going to need top notch hoops teams on-the-court to gain the requisite NCAA Tournament credits to pay the bills. At the same time, VCU would be an Eastern-based addition to balance out all of the other probable expansion candidates that are located in the Midwest. However, I’m wary about VCU being an addition based on short-term results as opposed to long-term institutional fit. What surprises me is that there has been zero buzz about the Catholic 7 looking at Richmond, which has a solid basketball resume itself and is a better institutional fit as a private liberal arts school located in the same market as VCU. It’s not an accident that SLU was added by the Atlantic 10 immediately after Conference USA stopped its hybrid model after the Big East raids of 2003, while VCU and Butler were only invited this year. SLU would be a long-term move in a solid TV market that’s a great institutional fit and makes geographic sense assuming that the Catholic 7 wants to add Creighton. I have all of the respect in the world for VCU as a basketball program, but SLU would be best for the new Catholic 7 league for the long run.